Scottsdale homes range from mild to wild. The diversity of homes is matched by the types and styles of roofs that protect them from the extreme temperatures and weather conditions we experience in the Valley of the Sun. Like all homes, properties in Scottsdale are prone to unexpected roofing damage that often pop up with very little notice. 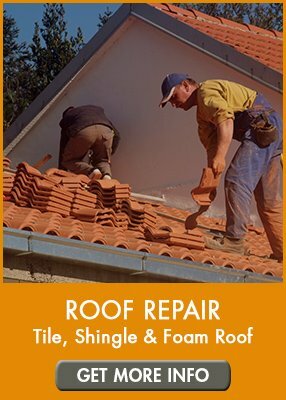 In those unique and untimely situations when you need a roof repaired quickly, professionally, and with a focus on quality – AZ Roofing Works makes all the difference. Since 2013, AZ Roofing Works has been a go-to source of superior roofing repairs in Scottsdale and surrounding cities throughout the Phoenix Valley. We are a licensed, bonded and insured roofing company, headquartered in Mesa, Arizona who proudly serve home owners, real estate agents, and commercial property managers. 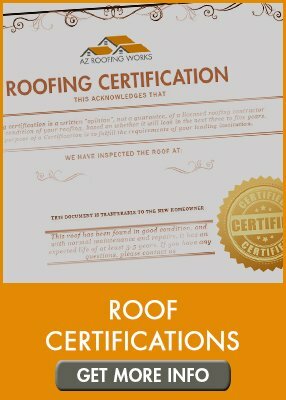 We leverage our dedication to quality over quantity, our extensive knowledge, and proven results to complete all roof repair projects in Scottsdale on time and always within our budget. We also complete detailed clean-up after each roof repair or replacement project we undertake. Edging Damage: Tile roof edging is designed to protect the roof’s deck, underlayment, and the soft material located underneath the tiles. Damaged edging can lead to roof leaks during our monsoon season. Cracked & Sliding Tiles: Tiles are incredibly durable – but they can, and often crack or misalign. The nice thing about tiles that are cracked or sliding, is that sometimes individual or small sections can be replaced – without having to replace the entire roof. Corrosion: A haboob can pop up with very little warning. While they can cause a lot of havoc and damage, blowing wind and sand can cause tiles to wear thin and sometimes require replacement or repair. Buckled or Curling Shingles: Asphalt or polymer shingles will eventually buckle, warp, or curl due to extreme heat in Scottsdale most of the year. When the shingles are damaged, it can expose the underlayment. 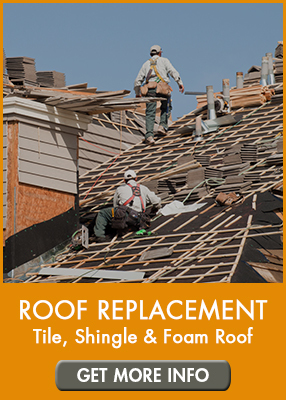 Missing Shingles: It is also common for shingles to become loose – especially during the late summer monsoon season when thunderstorms and haboobs arrive. Granule Loss: In most cases, the first part of the shingle to wear thin are the granules. As they wear out, they can warp, or lead to leaks. Reduced Ventilation: Ventilation installed in a shingle roof permits air to flow in and out of the attic. When ventilation sources are clogged or damaged, it can lead to roof leaks. Flat or foam roofs are known for having a luxurious style, however, they are also incredibly energy efficient. The lightweight construction can lead to damage or sources of repairs. Edge Damage: Just like a tile roof, edging on a flat roof is critical for protecting the underlayers and foundation. When it’s damaged or bent, it can cause water to leak underneath. A Cracked Membrane: The membrane is installed under some flat roofs but can crack due to exposure to heat, excessive water damage or poor installation. Ponding Water: Since they are built with very little angle, a flat roof requires drainage points to help remove water. If the drainage is blocked, water can pool on the roof, causing damage to membranes and other underlayment materials and possibly causing roof leaking.